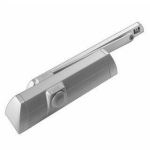 The Dorma TS90 Cam Action Door Closer is technically superior and boasts incredible value. This quality door closer is suitable for use on a wide range of doors in a variety of situations thanks to its various mounting options and reliable operation. The TS90 features proven technology incorporating a heart-shaped cam that will benefit any specifier or architect. It is convenient, cost effective and provides little to no resistance meaning it is easy for the user. Please call to order an alternative finish.